Reborn again is kira.nu's very own shrine (and TAFL-approved fanlisting!) 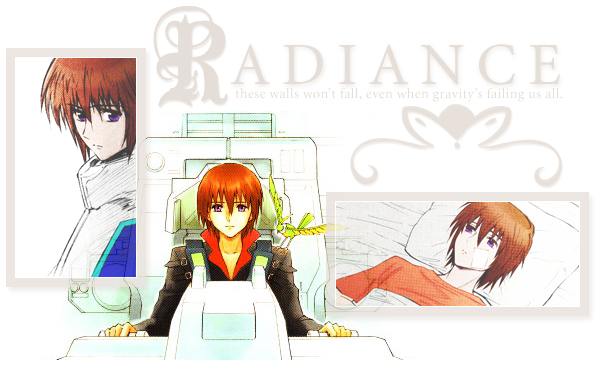 to its namesake, Kira Yamato: RADIANCE. I am the one they call Alison, and I am aware of how sorely overdue this was, and I apologize to anyone who still comes here (does anyone still come here? haha). The site is brand new for the Summer of 2009, in celebration of... I don't know, something. Use your imagination! The lyrics on this page come from a song called "Tall Tales Taste Like Sour Grapes," which is the property of a wonderful band called Fair To Midland. Check them out!